This morning Jason and I got up early to get in our run for the day. He had meetings most of the morning, and the forecast was for just shy of 90 degrees. So begins the transition to early morning runs to beat the heat. Honestly, I love running early. But, I am not a morning person and hate actually getting up. But, once I get out there and get moving, it really sets the tone for the day. It's always so peaceful before the sun is up. The world is simply quieter, still. I settled into a good pace right away. Love it when that happens. We were mostly silent, but chatted in spurts here and there. We passed just a couple of people out walking, they seemed surprised to see us. The goal was an easy 4 miles, but we ended up doing 5 miles. I guess that's indicative of how well the run went. I did want to re-visit yesterday's post. Not because I want everyone to see the picture again, but after posting and seeing comments it made me realize just how extremely insecure I am. Does that sound crazy? I work damn hard, I should be more proud. Yet, somehow, I'm super insecure. I don't quite see what others see. Rather than focus on the highlights, I tend to find things to nitpick like cellulite here and there, or my legs being less defined than they've been in the past, or not having the abs I once had. But my legs are strong. They can carry me for 9 miles and more. My core is strong and sturdy. Maybe some of this is also being flat out ticked off with my body right now for what I perceive as failing me somehow. Damn my piriformis. Damn my plantar fasciitis. I've been in physical therapy for three months now. My heel has good days and then a few bad ones. But my piriformis? It's enough to make you want to give up. I worked really hard adding in all the exercises to strengthen the muscles that, when weak, supposedly lead to piriformis problems. All that did was aggravate it. I do my PT exercise, roll, stretch, etc. and that aggravates it. Anyway, I guess I'm trying to find the root of some of my insecurities. And trying to refocus towards the things that I like or find the positives - like knowing my legs will carry me far even if they hurt. How do you deal with insecurities? Does posting pictures of yourself make you nervous? Or are you proud (as you likely should be)? Rather than end that little segment on a down note, I thought I'd share some positive blog inspiration from today. These really struck home with me today. I guess it was the theme of living with "IN" the moment (Jessica at EatDrinkBreatheSweat), learning to enJOY (Lindsay at Cotter Crunch), and always remembering the power of "Thank You" (Lindsay @ The Lean Green Bean). As you have probably figured out by now, I'm kind of digging grilled kale. Since it was nice weather this evening, I decided to grill out - kale of course. I had thought about doing the Grilled Kale & Veggie Salad initially. 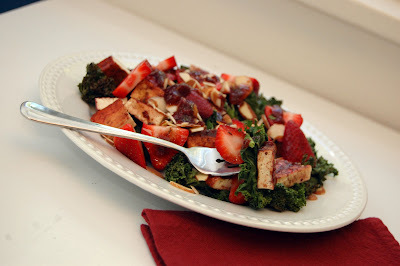 But, I picked up strawberries the other day and thought I'd do a Grilled Kale and Tofu Strawberry Salad instead. Just something different. 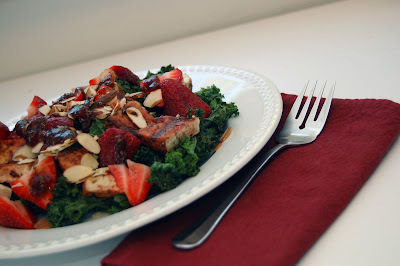 I dry-seared the tofu then let it marinate in a combination of balsamic vinegar, sugar-free strawberry jam, parsley, splash of olive oil, and a dash of salt (I made extra to use as the dressing too). I grilled both the kale and tofu then just tossed on freshly diced strawberries and slivered almonds along with the Strawberry Balsamic Vinaigrette. Don't forget to enter my NuNaturals Stevia Giveaway! You have until midnight May 3.